Our hot water tank kicked the bucket, and these guys were FANTASTIC!! Went way over and above, and did an awesome job. So very impressed with the knowledge, professionalism and the reasonable prices!! I have used Silvertip in my home and also at my business. These guys are at the top of their game. I have recommended them to family, friends and colleagues. I also purchased one of their reverse osmosis systems at my place of business. I have over 30 employees and have cut my distilled water bills to zero and the system has already paid itself off in less than a year. Keep up they great work Silvertip. Tyler Garden from Silvertip Plumbing installed a Kinetico Home Water System in our home May 1, 2015. Our expectations of this system have been exceeded. I no longer have dry skin, no need for lotions, my laundry is whiter and brighter. Our dishwasher cleans better also. What a relief of not buying bottled water any more, we drink right from the Reverse Osmosis tap. Along with the water being great, just want to say Tyler is amazing also. Soft spoken, friendly, very knowledgeable and informs you of the history of the company. It’s nice to know that they are right here in Grande Prairie if you need supplies in the future. He came back within a week and made sure that everything is working as promised. Tyler came to my house to help me install the Reverse Osmosis System that came with my house. I didn't even buy it through you guys and you were still so helpful to me. Tyler got it installed in about 30 minutes and we chatted the whole time. Thanks. Silvertip Plumbing & Water Solutions has been amazing to deal with. I purchased a Kinetico city water system to soften the water and remove the chlorine. My personal favourite is how it feels to shave with soft water and no “soap scum” on the shower doors. Thanks Silvertip! For the last week, we have been enjoying our new water system by Kinetico. Thanks goes to Tyler and the pros at Silvertip Water Solutions for giving us the best water we have ever had. For years, we have had soft water in our other homes. It has been something we have wanted to install for sure in our new home as well. We thought we would try out a Kinetico System this time and have fallen in love with water all over again. We selected the whole home system after hearing how affordable it was to do a complete package. The soft water is amazing. I have a little mirror in the shower to help get my shaving lines just right and keep the mess out of the sink. It has been really cool to have it be clean and without water spots every time I go to shave. It is the little things that really help me appreciate the system. The Reverse Osmosis water has been a dream to drink. There have been a few surprises we were not intending to have. One of which is that a glass of water that sits for a couple of hours stays crisp and clean tasting. In fact, we have a couple water containers in our bathroom for after we brush our teeth at night and for three days in a row, the water tasted perfect. Of course, it was gone by then but there is something to be said about having water that has nothing in it to settle out and alter the “freshly poured” taste. I was also surprised by visiting a local favorite restaurant and getting the usual glass of water with a lemon and being amazed at the levels of chlorine that I had never even noticed before. This is an unreal difference for both the way we feel drinking the water, and the incredible quality of the whole home system. If you’re like me, you just don’t know what you are missing until you have a high quality water system. Just wanted to give a quick shout out to the team at Silvertip Plumbing! We were having a few problems with hard water issues and decided that we had to do something about it. I am the type of guy that researches the heck out of everything before making a substantial investment. What I discovered was that everyone was raving about these so called Kinetico water softeners and how they were the best units hands down. After seeing this, I figured this is what we needed. 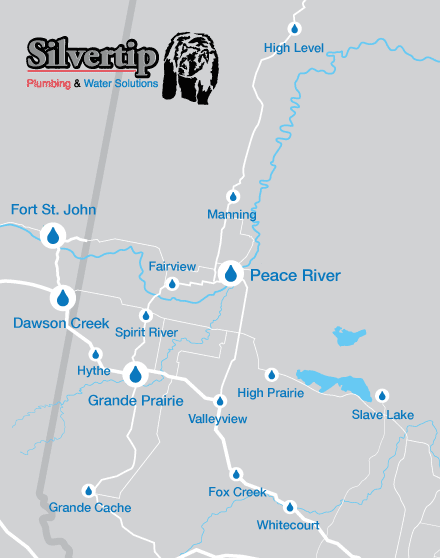 Further investigating I found that Silvertip Plumbing in Grande Prairie, Alberta was the closest distributor. I gave them a call and the rest is history. They were amazing to deal with and answered all my questions regarding a Kinetico water softener system. Within a few short days, they were out to install our system. The result was amazing, our clothing washed up nicer, our dishes no longer had that nasty white film with spots all over them. And having a shower felt like a whole new experience. Our skin was no longer dried out and flaky. A few cool features of the system was the fact that it did not need power to operate so when the power went out, you did not have to worry about reprograming your timer on your system to flush. Another feature was that it has two tanks so when one side was spent, it would switch to the other tank and flush so you were never without soft water. Just an amazing system! The Kinetico is a system that you set up, and other than adding salt to the system once in a while, you can forget about it and be confident knowing that it is doing its job. We were so happy with the Kinetico water softener we purchased that after our existing reverse osmosis system at the time stopped working, we decided to purchase the Kinetico K5 RO system from Silvertip Plumbing. As usual they were out quickly and installed the system; couldn’t be happier. The water quality is outstanding! And just like all Kinetico products, trouble free.